My Sunday samples from Allies Of Skin came in a set of four, two All Day Masks and Two Overnight Night Masks. I used them this week but these are products that you need to use regularly to experience results, however, it was a good toe in the water moment, especially with the All Day Mask. I went in with the Overnight mask, I cleansed, on the double of course, I didn't apply anything else and went in with the mask, make sure you work this into the skin if you plan to leave it on overnight as I did, otherwise just smooth onto skin and leave as you would with any mask. I'm a huge fan of leaving masks on overnight and this is an expensive product, so get your monies worth. I applied it the early evening so it has time to absorb and I wasn't wiping it all over my pillow. The morrow, yes the next day, you know what I'm talking about, my skin looked better, slightly brighter and skin was smoother, imagine the miracles that could unfold with regular use from this cell energising, protective cream, great for flights too, it helps prevent the skin dehydrating. I liked my first use and my second sachet equally gave me brighter skin a few days later, all good, expensive, but, well, it works, so it's on the list! Night and Day, you are the one, Cole Porter hadn't any idea that this would be used by a Yorkshire lass talking about skincare but take the compliment, Cole. 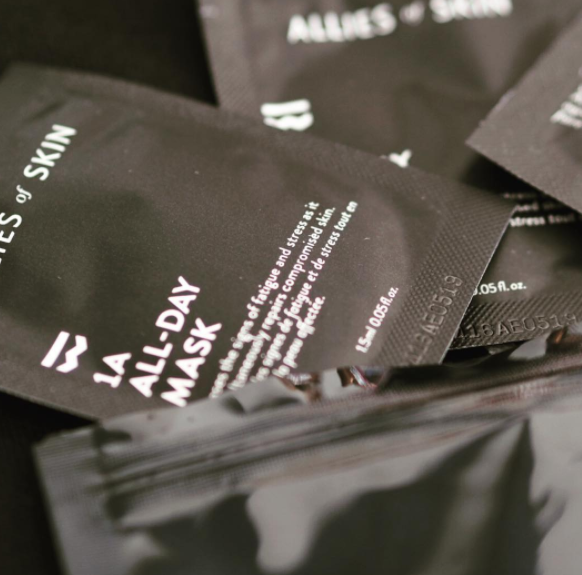 I adored this packet of 1A All Day Mask, almost love, but again, I feel you need regular use to really get a true picture. Mask, booster, treatment, take them all and think hybrid moisturiser, this baby takes skin care to the next level. Packed to the brim with Hyaluronic acid, this keeps skin plumped and it really was an impressive base beneath my makeup. My makeup looked flawless for the whole day, no setting spray, no re-application, it quite simply looked good. On my list it goes and in time it may make an appearance as part of my skincare. Allies Of Skincare have produced a select range of products that work, who needs more than that?